When Ambrosia Software first released WireTap Anywhere (WTA), they changed the way I thought of my audio hardware. 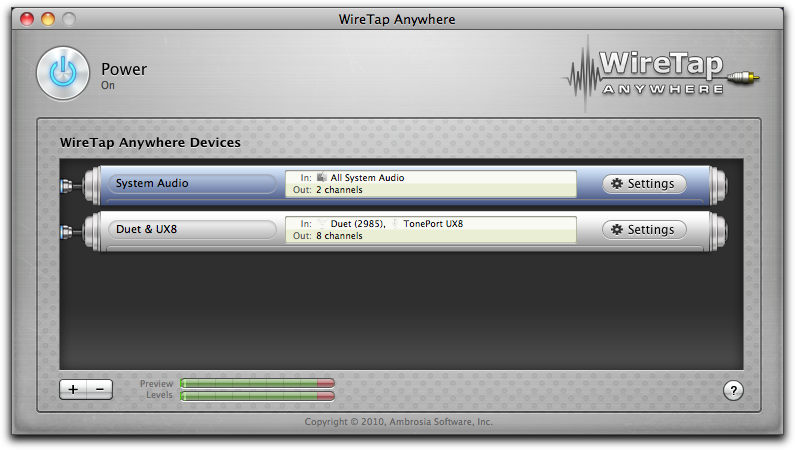 Now with version 2.0 almost ready to be released, WireTap Anywhere will completely change the way I record audio. 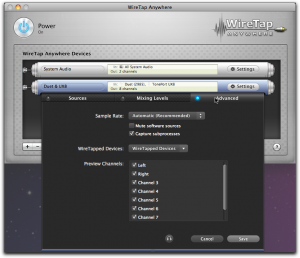 WireTap Anywhere is one of those software applications that you don’t know you need until you use it. Once you have it, you’ll never have a computer without it. 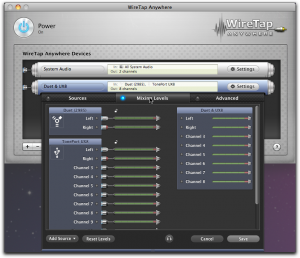 The original WTA allowed users to combine separate hardware devices into one WTA device. That means that you can have one piece of hardware with four inputs, another hardware device with two inputs and combine them in WTA. 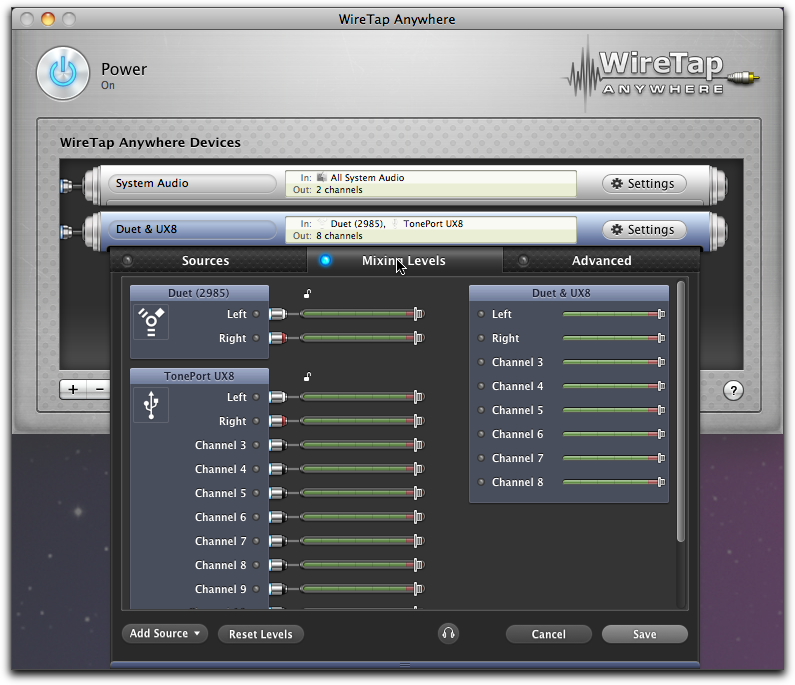 Essentially, your Mac sees one device with 6 inputs. The new version takes that a step further by allowing you to route individual hardware channels to whatever inputs you want on the computer. For instance, If I plug in my guitar, I can take input 1 from the hardware and route it to inputs 1,3 and 5 in the computer. If you’re using Logic or GarageBand, you setup three audio channels and have them listen to each of those inputs and you will hear guitar. You can put separate plug-ins on each channel for amps, effects or whatever you want to do — each one is routed and recorded separately. WTA isn’t limited to just hardware. You can route software applications too. 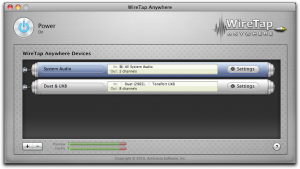 If you have iTunes running, you can add iTunes to a WTA device, route its channels and whatever comes out of iTunes we be routed to WireTap Anywhere. 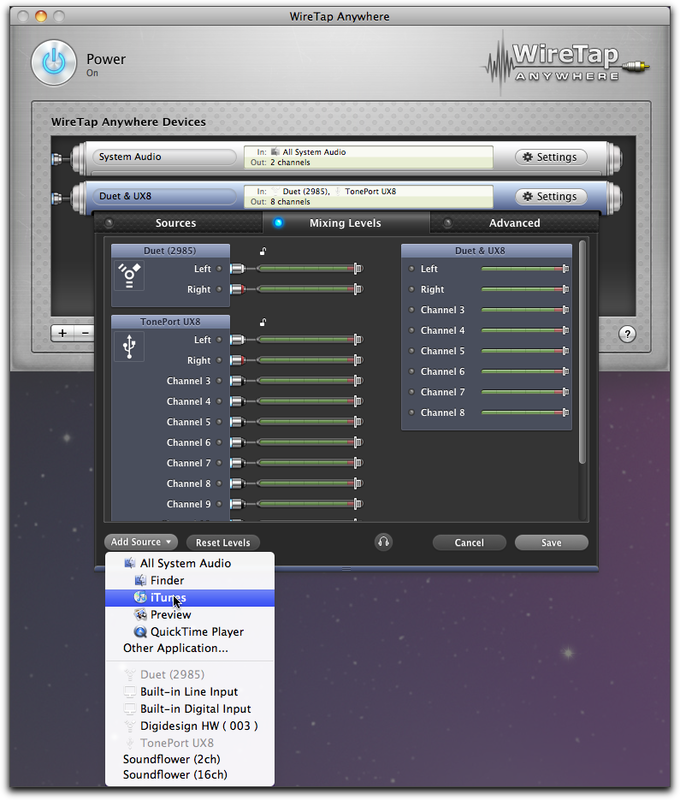 The new version also has a built-in mixer. 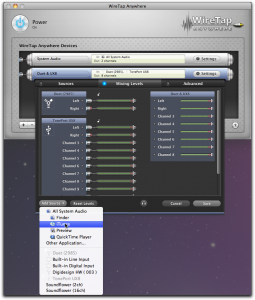 This is useful when combining hardware and software devices because you can control the levels before the audio even hits your computer. With its new monitor button, WTA will allow you to set mix levels and you can hear what everything will sound like. You can do some pretty incredible things with WTA 2.0 when you sit down and think about it. Any channel can be routed to any other channel. You can route an instrument to several tracks, you can route all guitars to individual tracks and to a combined track or you can route everything you record into a stereo mix track. I’ve given you a few examples of how I use WTA, but there are so many possibilities. Podcasters, musicians or anyone else that works with audio can do some amazing things with WireTap Anywhere 2.0. Ambrosia has a definitely winner on their hands with this new version.